(L to R) Margo (MIRANDA COSGROVE), Edith (DANA GAIER) and Agnes (NEV SCHARREL) in DESPICABLE ME 3. ©Universal Studios. No problem. 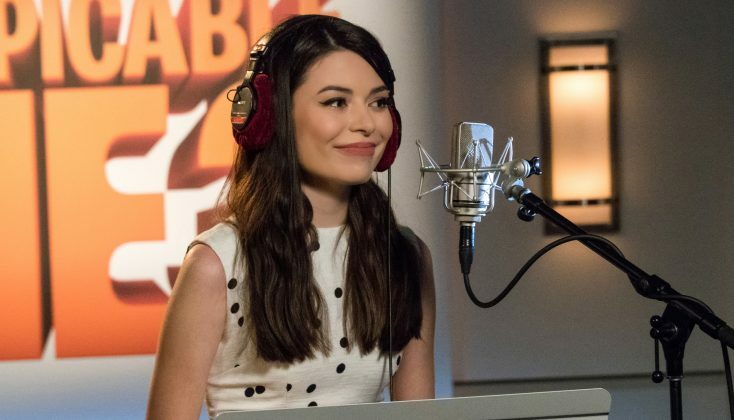 Cosgrove, best known for her starring role in Nickelodeon’s “iCarly,” still sounds like the precocious pre-teen first-born daughter of supervillain-turned-do-gooder and family man Gru (voiced by Steve Carell) in the action comedy “Despicable Me 3,” from Universal Pictures and Illumination Entertainment. In this second family friendly sequel, Margo and her two younger sisters are getting used to being a nuclear family with Gru, his new wife, Lucy (a fellow spy from the Anti-Villain League), and their lifestyle of being crime busters. However, when Gru loses his job after a botched mission to capture a villain, he wonders how he’ll take care of his family. He soon discovers he has a rich twin brother Dru, with a bad boy streak, and has to fight the temptation of going back to his wicked ways. Meanwhile, Gru’s new wife Lucy (voiced by Kristen Wiig) is trying to cope with instant step-motherhood. Margo, a bookish type, offers her new mom advice on how to be more assertive with the girls. The advice backfires when Lucy insists that Margo participate in a cheese-eating ritual while they’re visiting Dru’s homeland, which results in Margo becoming accidentally betrothed. Besides the family chaos situations, “Despicable Me 3” features the ongoing mayhem with Gru’s pill-shaped Minions who want to see their boss return to his former criminal ways instead of attempting to redeem himself and setting his brother on the right track by finding and capturing a former ‘80s child star bent on seeking revenge against the world for his downfall. Cosgrove says she not only is one of the voice characters in the popular animated franchise, she also is a fan. Currently enrolled at the University of Southern California, the young actress manages to juggle her college courses with her acting career. She spoke about returning to the role of Margo and being part of a popular movie franchise. Q: In this sequel, your character, Margo, is trying to help her new mom adjust to parenthood. Cosgrove: Yeah, it’s like the roles are switched up because she’s been a mom to her two sisters and now (stepmom) Lucy is telling her what to do. Q: This is the third “Despicable Me” for you. Has the voiceover work changed for you? Has it gotten easier to do? Cosgrove: It’s always been pretty fun and easy but I think it’s gotten easier because when I was younger, I was a little shyer about doing the lines. You have to pretend a lot. It’s like you’re on a roller coaster or you’re falling off the side of a mountain. Sometimes I held back a little more. Now, I think I’ve gotten to know everybody and it’s just so much fun to be in the booth and kind of go crazy with it. Q: Do you get the chance to work with anyone else (to record the voices)? Cosgrove: I feel like I’ve gotten to know Steve Carell pretty well just from doing the publicity from the movies but actually doing the recording for the movie, we record it all by ourselves. Q: I assume you record your dialogue over the course of several sessions, right? Cosgrove: I went in 12 times for this movie and every time I went in it was maybe an hour or two. So, it’s not like too long or too crazy. It’s probably a lot longer for Steve, especially for this one because he’s playing two characters (Gru and Dru). But, for me, it’s just fun. Because they do all the animation in Paris, the directors (Eric Guillon, Kyle Balda and Pierre Coffin) are on Skype and they help the entire time with, “Try one this way. Try it that way” or “Do whatever you want with it five times and just see what comes out.” So, it’s a cool thing to get to do. I can’t really describe it as anything other than fun because you could go in in your sweats and it’s so relaxed and then you get to see the movie in the end and what they’ve been putting together for the last four years and it’s really exciting. Q: Do you see Kristen Wiig when you’re promoting the “Despicable Me 3” movies? What’s it like getting back together with some of the cast members? Cosgrove: It’s really fun. With the last movie (“Despicable Me 2”), I was so glad to get to meet her because she’s one of my favorite actresses. It’s funny, she was in the first movie too but played a different character (Miss Hattie), who was the mean head of the orphanage. She’s playing such a sweet role now (Lucy). She can do so many different things. It’s cool getting to be in a movie with her. I think she’s hilarious. I would say I’ve gotten to know Steve Carell a lot better because I’ve been around him more. But Kristen is awesome, really cool and nice. Q: Do your younger fans know you are the voice of Margo and do the kids ask you, “What’s it like being Margo?” Do you get fan mail? Cosgrove: On Instagram and Twitter and stuff people will be like, “Oh, I can recognize your voice. I knew it was you.” Some people seem to figure it out just from watching the movie. Sometimes it’s cute because I have a friend who has a niece coming to the premiere. She’s four and she loves to tickle me. What my friend was explaining to her was that I was the voice of Margo she was like, “No. Miranda doesn’t wear glasses and Miranda’s old. She’s not 12.” She just didn’t get it at all. My friend kept trying to say, “No, she goes in and does a voice,” but she didn’t get it. She thinks the Minions are really out there somewhere in the world and that all the characters are real. Q: Do you have a favorite Minion? Cosgrove: Bob’s my favorite Minion. He’s the one that has the different-colored eyes. He’s really cute. I think he’s the cutest. I like Mel in this movie. He came out of nowhere. Q: Mel’s become a breakout character. Cosgrove: Yeah, suddenly he’s taking over all the Minions. Q: Do you get to do some improvising with the dialogue when you were recording? Cosgrove: Yeah. The way the directors do it is really cool. The lines are pretty straightforward. They’ll be like, “Do it exactly the way it is on paper then try it this way and that way.” Then they’ll say, “Okay, you know what the scene is, so do the lines as you’d like. Do what you’d do in the situation.” You can add extra lines or little funny things. Then, obviously, in the end it’s up to them which takes they choose but it’s just fun to be in the booth and get to try a bunch of different things. Q: Is there some extra stuff you recorded that might be on the DVD or Blu-ray? Cosgrove: I don’t know if they’ll ever use it but I recorded some stuff. There’s like a parting for her in Freedonia, where (the villagers) are going to have to sacrifice a goat because I didn’t marry the boy. There’s a whole scene I recorded where I’m talking the town into not killing this goat. Lucy’s trying to help me. I don’t know if it will end up as a bonus feature, though. A lot of the time when you’re recording, they have random pieces of the storyline, and then they come up with something totally different two weeks later. It keeps changing as they are figuring it out. Q: You’ve seen the final cut. What do you think? Can you watch it objectively since you aren’t seeing, but hearing yourself? Cosgrove: Definitely, more than anything else I’ve done, because I didn’t know what it was going to be like, other than the parts I recorded. I didn’t know exactly what they’d turn out like. Even with the first movie, after seeing pictures of the Minions and little clips and pictures of my character I still didn’t really know exactly what it was going to be, so it kind of like a surprise in a sense. Q: Do you respond in the booth to recordings the other actors who have already recorded their dialogue, or are the directors feeding you the lines? Cosgrove: Sometimes, if it’s a really important scene and Steve (Carell) had already recorded his part or Kristen (Wiig) already recorded hers, they would play their lines and I would respond. But, for the most part, it’s like a free-for-all in there. Most of the time you don’t have anybody to play off of. Q: Are you ready for “Despicable Me” 4 and 5? Cosgrove: (laughing) Yeah, I’m just so happy to be a part of it. It’s been so much fun from the very beginning. I feel lucky to get to do it. I would do it forever if I could. Hopefully, people will like this one. I think it has a lot more action than the other (“Despicable Me” movies). There’s something going on every second. It’s really fun. Q: Are you still in college? Q: How are your studies going and how are you balancing that with your career? Cosgrove: It’s pretty easy to balance it because, with college, I haven’t really been in a huge hurry to finish so, basically, I’ll focus on school and do a semester, and then take a semester off and I’ll do a TV pilot or a season of a show. That’s what I’ve been doing since I started, which has put me behind but I don’t mind too much. I just want to finish, eventually. I have about a year and a half of classes left so, like, three semesters. I still have some work to do but I’m getting there and it’s cool because I want to act. That’s what I really want to do if I could pick. That’s why I don’t mind taking a semester off here and there. Q: I assume you are learning about filmmaking but you have also been around sets for most of your life. Do you see yourself acting then, later, being a filmmaker? Cosgrove: Maybe. The reason I wanted to major in film was because I wanted to take screenwriting classes. I love Kristen Wiig because she writes a lot of her own stuff, and Tina Fey. “30 Rock” is one of my favorite shows. With female comedians, it seems like they really know their own strengths so, if you are able to write for yourself, that would be the best thing ever. It’s just been fun because I’m trying to find a voice in writing. I’m getting better at it. Q: You’ve recorded a few EPs and albums. Are you continuing to write or record music? Cosgrove: Sometimes I record songs. Because I’ve been focusing more on school, I haven’t been as focused on music, although I still really like it. I really love the show “Crazy Ex-Girlfriend.” (Rachel Bloom) sings on the show in a comedic way so I think if I ever were to do music again, it would be fun to do something that was funny like that. I like singing but mainly I really like acting in comedy so if I could incorporate that it would be cool. Cosgrove: I’ve done pilots like the last four pilot seasons, but it’s just hard with pilots. Q: They have to connect at the right place at the right time, right? Cosgrove: Yeah, you really have to be lucky. I have a great idea of what I’d like to do. I really want to be on a comedy, maybe like a single camera TV show. That’s what I’d really like to do. Miranda: That would be awesome.